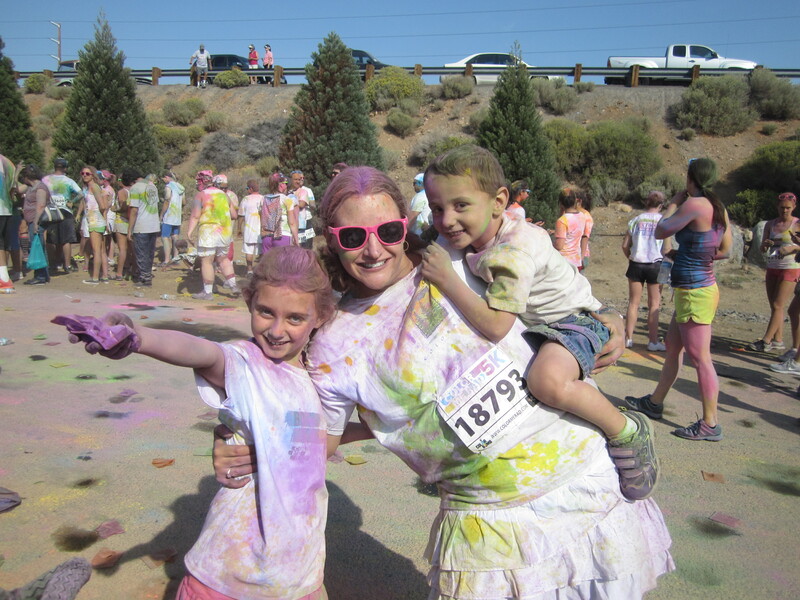 Last weekend, I took the kids to do the Color Me Rad 5K. When I originally signed up for this run, I thought I’d start having my daughter train with me so that she’d be ready to run it. Ah, the best laid plans… Turns out any time I had the opportunity to run, I usually had 30-40 minutes, which meant I could either run around the block by myself and get a workout, or try to bring her and go at her pace. So instead of training, I did the 5K at her pace. She started off great, saying she wanted to run the whole thing and asking what she’d get if she won (haha). The running lasted about 200 yards. Then, we walked fast, slowed down, and she started saying she wanted to sit. The only thing that kept her going were the color stations on the course, where people would either throw colored powder on you or shoot you with a colored liquid. At one point, she “couldn’t go any farther”, and I ended up kicking my son out of the stroller to have him ride piggy back and put her in the stroller. At the next street, I started to cut the course and go straight to the car. I’m in decent shape, but doing a 5K hoisting 90 pounds of kid weight and listening to whining and crying wasn’t what I wanted to do. As soon as my daughter saw me about to cut the course, she rallied, and said she could finish the 5K. Of course, at this point, my son decided he liked being carried, so I carried him while my daughter pushed the empty stroller. Despite the rough patch in the middle, it was a really fun event. We really loved the color party afterwards where you use the “color bombs” of bags of color to throw at friends and family. After the race, I took them to the pool at Squaw Valley, which turned out to be a brilliant way to get all of us clean without messing up my bathroom!